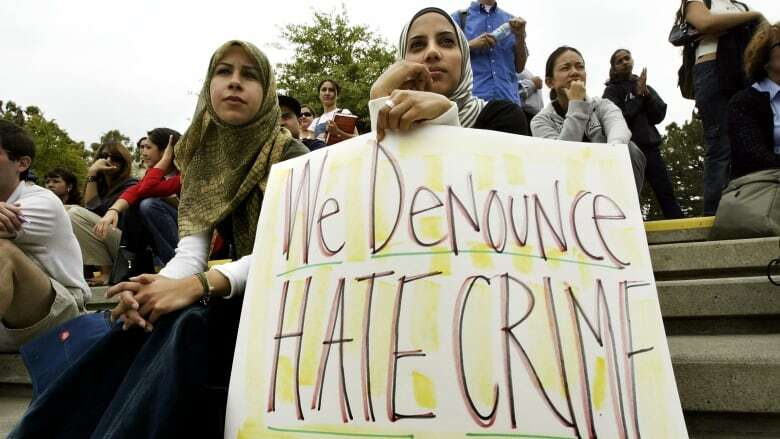 Not since the Sept. 11 attacks on America have anti-Islamic hate crimes been at such high levels, according to FBI statistics, which show a 67 per cent surge in criminal offences targeting Muslims last year. Muslims in the U.S. are afraid, and newly released hate-crime statistics leave little doubt about why. 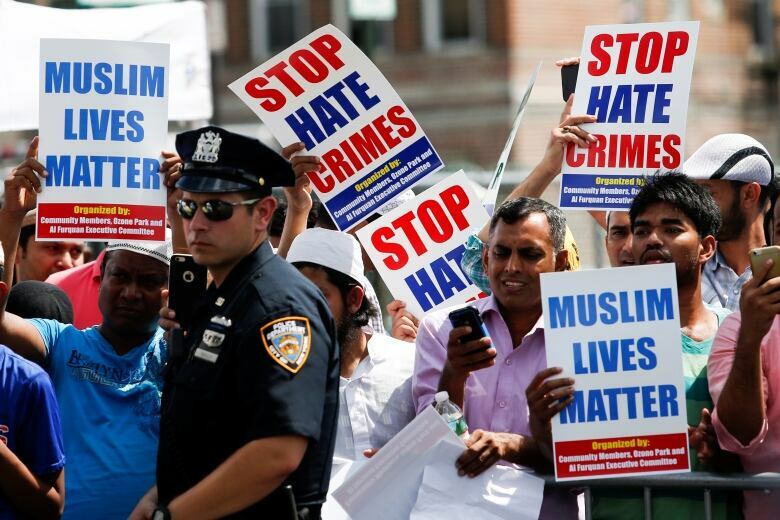 Not since the Sept. 11 attacks have anti-Islamic hate crimes been at such high levels in the U.S., according to FBI statistics, which show a 67 per cent surge in criminal offences targeting Muslims last year. The FBI report shows there were 257 anti-Muslim incidents involving 307 victims last year. That's 103 more incidents than during the same period the year before. All told, the bureau's annual Hate Crime Statistics Report, which collects data for 2015, included 5,850 total criminal incidents against a multitude of targeted groups, including Muslims. Overall, that indicates a 6.7 per cent uptick in incidents from 2014. Incidents of hate crime motivated by anti-Islamic bias peaked in 2001 at 481 incidents. The figures released Monday come amid a time of deep political apprehension following last week's presidential election that saw Donald Trump blaze a populist trail to the White House. A mosque in Sarasota, Fla., says it will be handing out pepper spray on Friday to women who wear hijabs or feel threatened by hate attacks. At the Islamic Centre of Detroit, beginning this week, a martial arts teacher is hosting twice weekly self-defence workshops. And last weekend, the Muslim Centre of Middlesex County in New Jersey hosted a 90-minute "active shooter" preparedness session. "If you SEE something, SAY something," a flyer advertising the seminar reads. Other topics that were to be discussed included a building evacuation plan. 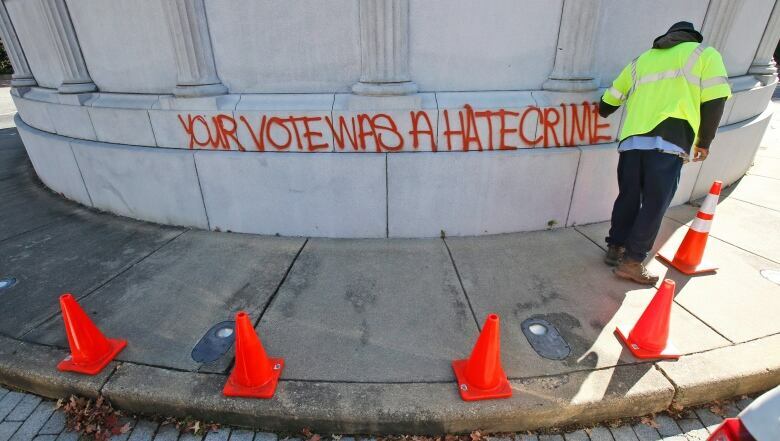 The FBI defines a hate crime as a "criminal offence against a person or property motivated in whole or in part by an offender's bias against a race, religion, disability, sexual orientation, ethnicity, gender, or gender identity." 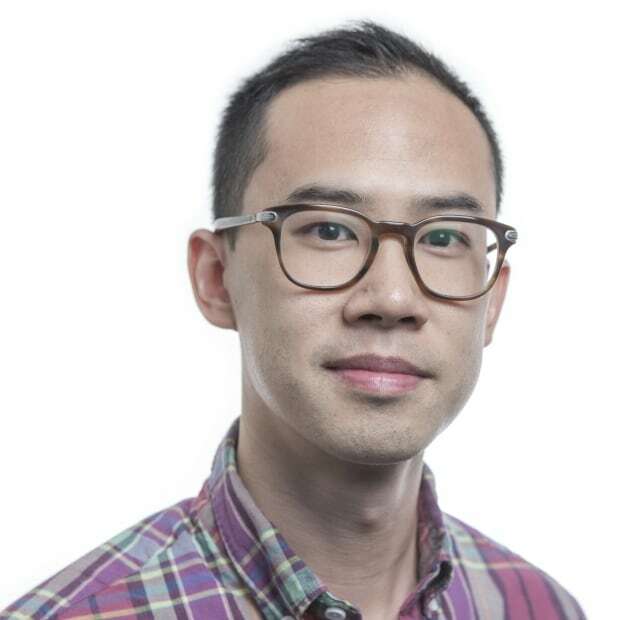 While 57 per cent of reported hate incidents were motivated by race and ethnicity, the federal law enforcement agency found 20 per cent of hate crimes were related to religious bias. There were 664 anti-Semitic offences reported last year — the highest of any religious group and a rise of nine per cent. But other targets included Catholics, Protestants, Mormons and people belonging to the Eastern Orthodox Church. More than one-fifth (21.9 per cent) of the 1,402 victims of anti-religious hate crimes in 2015 were due to anti-Islamic bias. "It's really unfortunate, this atmosphere of hate," said Kassem Allie, executive administrator for the Islamic Centre of America in Dearborn, Mich., a community known for its large Arab and Muslim populations. "We're trying not to alarm our community, but we want to inform them to take precautions. Watch their surroundings. Be in a position to defend themselves if they feel threatened." 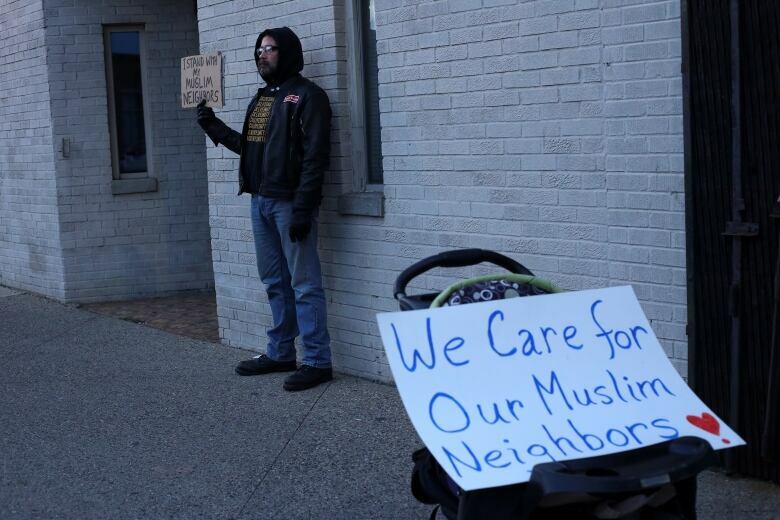 Dearborn resident Ribhi Hazin has been hearing startling conversations lately at the hospital where he works. "I've never, until now, heard a physician tell me we should think about getting concealed weapons," the Muslim physician said. "I've heard that two or three times now in the last few days. That's not counting the nurses and patients who have expressed that." Hazin, a father and an internal medicine specialist who prays at the Islamic Centre of Detroit, said last week's election outcome has become increasingly worrisome as he learns about more hate-motivated attacks. "We've had long discussions on the floor of the hospital. Actual discussions now about do we need self-defence classes or concealed weapons?" Ibrahim Hooper, spokesman for the Council on American-Islamic Relations (CAIR), said the organization began seeing a spike in nationwide incidents beginning in late 2015, and reports have accelerated beyond the Nov. 8 election. "We're seeing the mainstreaming of Islamophobia by public figures like Donald Trump," Hooper said. The terror attacks in Paris and San Bernardino, Calif., occurred late last year, as did Trump's controversial call in December for a "total and complete shutdown" of Muslim entry into the U.S.
Now that he is president-elect, Trump has been unclear about whether he'll make good on his Muslim ban. But some observers have suggested that the rhetoric nevertheless seems to have energized a racist base. Iowa City police this week are investigating a note posted to the door of a Sudanese-American Muslim family that read: "You can go home now. We don't want n--gers and terrorists here," followed by the hashtag "#Trump." And police investigating the afternoon mugging of a San Diego University student last week said she was targeted for wearing her hijab. Two men on campus reportedly made remarks anti-Islamic remarks and spoke about Trump before yanking off her hijab, then stealing her backpack, purse and car. At the University of Michigan, a stranger approached another Muslim student last Friday and threatened to set her on fire with a lighter if she did not remove her hijab. She complied. Hooper worries about more such incidents, pointing out that the appointment of Trump's new senior adviser, Steve Bannon, was praised by white nationalists and leaders in the anti-immigration movement. "We're in very dangerous times, and we just see things getting worse," Hooper said. There hasn't been a lull in incident reporting over the past two years, said Robert McCaw, CAIR's director of government affairs. "It used to be that you might receive one of these reports a week. Starting in 2015, it was like three a week when the primaries were beginning," he said. McCaw said these days there are some periods when he will hear a report a day. He suspects anti-Muslim bigots on the extreme right have become "emboldened" to commit hate crimes following Trump's ascent to office. "The new normal isn't normal," he said. "[Trump] said 'Stop it,' (in a 60 Minutes interview), and 'Stop it' is great. But we're urging him to go further. We're calling on Trump to make a denunciation of hate crimes in his name."